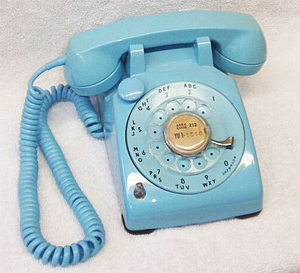 The 500 was the Bell System's mainstay phone for decades, first as a rotary dial and then push-button, in many colors. Like its predecessor, the WE 302, it was designed by industrial designer Henry Dreyfuss. As an improvement over its prodecessor, the 302, the dial markings were placed outside of the fingerwheel holes for improved legibility. The slightly larger base provided room inside the 500 for an adjustable bell ringer and enhanced electronics. The more angular G1 handset design replaced the curves of the 1930-looking F1. In the early 1950s, the Bell System began to promote the new 500 sets in "designer colors" for an affordable one-time non-recurring charge at the time of installation. The light blue 500 set at left has the rare and special 'mushroom' night-light just above the number 4 on the dial.